Image loading in web browsers typically manifests itself in two ways. One behavior is for the browser to withhold the image until it is fully downloaded. Typically, an empty space is displayed in the interim period. The second method that web browsers employ is to progressively render the image as data is received. The most frequently encountered progressive loading scheme renders an image’s pixels from top to bottom. The latter has the benefit of showing some visual content to the user as the image loads, and otherwise assures the user the image is indeed downloading. More importantly, however, is that it allows for quicker recognition - imperative for efficient traversal of web content. Unfortunately, this top-to-bottom loading method may not render the pixels necessary for recognition until more than half of the image is loaded, wasting considerable time, bandwidth and energy. Perhaps a simple change, such as left-to-right or bottom-up, would prove more effective. Also worth considering are methods that do not load pixels in a predefined order. For example, an importance metric could be calculated for pixels or arbitrary regions in an image. When the image is being transmitted to a user, the “most important” pixels could be sent first. In general, it appears current image loading schemes are not aligned with how people create, capture, and view still content. This note provides what may be the first quantitative assessment of how different loading schemes perform from a human-centric perspective. Harrison, C., Dey, A. K., and Hudson, S. E. 2010. Evaluation of Progressive Image Loading Schemes. In Proceedings of the 28th Annual SIGCHI Conference on Human Factors in Computing Systems (Atlanta, Georgia, April 10 - 15, 2010). CHI '10. ACM, New York, NY. 1549-1552. Figure: The probability distribution of how likely pixels will be selected as "important" in an image.  A linear green to red scale is used, which represents a range of probabilities from 0% (never) to 52% (maximum likelihood).